It’s hard to believe, but Revolution Software has done the impossible: they’ve taken a really fantastic game and made it even better. Broken Sword: The Shadow of the Templars: The Director’s Cut is a remake of the original point-and-click adventure game from the mid-90’s. When it was first released, it stood out as a shining example of the genre, a remarkable blend of fantastic art direction and exceptional writing. The recent release takes all of this and gives it a near flawless transition to app form, complete with a hefty chunk of additional content, beautifully improved graphics, an innovative interface, and full voice acting. Fans of the original will be delighted by the newly fleshed out backstory of the female protagonist, Nicole Collard, while new players will be impressed by the remarkable depth of the story, as dark secrets are gradually uncovered by Nicole and the real star of the show, George Stobbart. George is on vacation in Paris when he is thrown into the heart of a centuries-old intrigue. 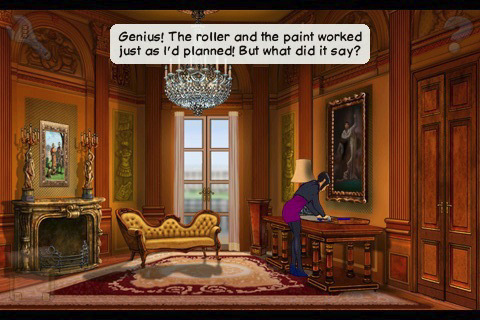 Smarter, funnier, and more engaging than any Dan Brown novel, Broken Sword’s writing is the driving heart of the game, but just about every aspect of this beautifully polished app is a wonder to behold. While the graphics haven’t changed very much from the ’96 originals, they have received a nice facelift, courtesy of Dave Gibbons of Watchmen fame. Where the original character designs were more cartoony, everyone now looks a little more polished and mature, wonderfully befitting the dark mysteries that characterize the game. And while a couple of the French accents are on the deliriously hokey side, the voice acting is still very well done and is a welcome addition to the gorgeously illustrated environments, along with the remarkably lovely orchestral soundtrack. Seriously, the music and audio direction in this game is superb. While some point-and-click ports have struggled a bit with interface issues, Broken Sword has an ingenious system in place that allows you to swipe to see all of the interactive points. No more wildly stabbing at the screen, searching for the right hot spot, just a lot of smooth accessibility. Even the puzzles have gotten a lot of tender loving care, many of them recreated to be suitable for a touch interface. Often they will be familiar puzzle-types, like locks based on block sliding, but they’re not always very easy. Happily, there is also a wonderfully gradual hint system in place in case you get stuck, for those times when you need just a little nudge or even a great big push in the right direction. No walkthroughs necessary! Even if you’re not a big point-and-click adventure game fan, this is a truly remarkable game, complete with fluid interactions, gorgeous art design, and really phenomenal story-telling. There is just so much to enjoy in this game for such a low price, this is really one you shouldn’t miss. AppSafari review of Broken Sword: Director’s Cut was written by Tracy Yonemoto on April 21st, 2010 and categorized under Adventure, App Store, Featured, Fun, Games. Page viewed 3715 times, 3 so far today. Need help on using these apps? Please read the Help Page.